Early in the offseason, the Texas Rangers have moved quickly to start plugging the holes in their starting rotation. 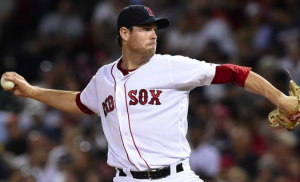 The Rangers have agreed to sign pitcher Doug Fister to a one-year deal worth $3.5 million plus incentives. The deal is pending a physical and reportedly comes with a club option for the 2019 season. Fister will join a Texas rotation that is likely to lose Yu Darvish to free agency. Signing early in the offseason is a complete reversal from what Fister did a year ago. Unsatisfied with his offers over the winter, Fister waited until the middle of May to sign. He eventually landed with the Boston Red Sox and made his season debut in June. He made 15 starts and 18 relief appearances, going 5-9 with a 4.88 ERA. The Red Sox then gave Fister the opportunity to start Game 3 of the ALDS against the Astros. However, he lasted just 1.1 innings before being pulled. The 33-year old Fister had a career year with the Nationals in 2014. He went 16-6 with a 2.41 ERA that season. However, he’s struggled to replicate that kind of success over the past three seasons. Nevertheless, he should provide Texas with a steady and reliable back-of-the-rotation starting pitcher. At the moment, that’s something the Rangers could use. The Texas rotation was middle of the pack last season. However, Darvish leaving in free agency leaves a hole behind ace Cole Hamels. The Rangers are also short on proven pitchers to fill out the rotation. Texas is high on Martin Perez and Nick Martinez. However, neither was able to distinguish themselves last season. A.J. Griffin is another rotation option. But he’s posted an ERA over 5 the past two seasons. If the season started today, those three would likely be guaranteed spots in the starting rotation. Such a scenario would be far from ideal for the Rangers. With Fister coming to Texas, the Rangers can now pencil him into the backend of the rotation. That should at least create some competition for the remaining spots. Earlier this month, the Rangers acquired 22-year old Ronald Herrera in a minor trade with the Yankees. Herrera and a couple other prospects like Yohander Mendez may get the chance to compete for a spot in the rotation during spring training. However, the Rangers don’t have much rotation depth in the minors. That makes the addition of Fister all the more important. Of course, it’s unlikley the Rangers are done addressing their rotation. As it stands, only Hamels, Perez, and Fister are starters the Rangers will feel good about heading into the season. The Rangers are no doubt hoping to add a frontline starter to pair with Hamels they way Darvish did this past season. Texas has already been connected with Jake Arrieta. It also wouldn’t be a surprise to see them pursue Lance Lynn. Both Arrieta and Lynn figure to be a little cheaper to sign than Darvish. If the Rangers can add a pitcher like Arrieta or Lynn to the trio of Hamels, Perez, and Fister, they may be content with their rotation heading into 2018. But if they can’t land one of those two pitchers, they could be left scrambling to fill their rotation. One thing’s for sure, signing Fister is only a start.